Excellent helium volume/lift ratio due to their rounded balloon shape. Powerful aerodynamic uplift for extra performance. 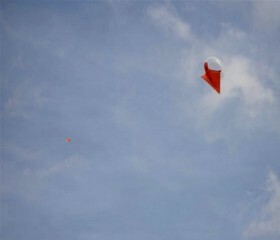 No kite/ blimp -fin adjustment required. 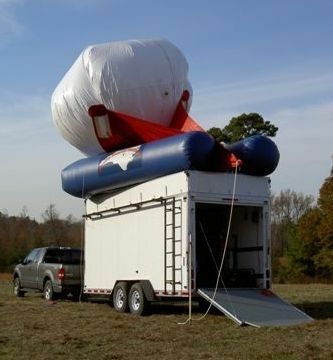 Simply slide in the spar, fill with helium and fly. 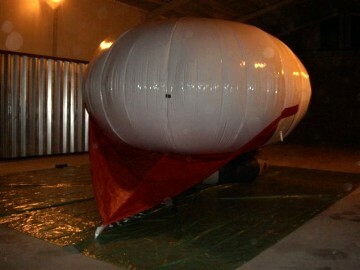 Few gas expansion/contraction problems due to their rounded balloon of flexible material. Numerous stable attachment points for cargo. only needs one or two operators in any weather. 64 cubic metre - Recently completed, the first of these large Skyhook Helikites will be used to lift radio-relay communications 5000ft above sea-skimming missiles at Elgin Air force Base, in the Gulf of Mexico. They will be operated from a Helibase situated next to a dedicated winch trailer provided by Carolina Unmanned Vehicles as part of the Helikite Elevated Platform - Transmission Relay (HEP-TR) SBIR Program. 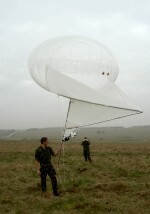 The electronic payload will be provided by Herley-RSS. 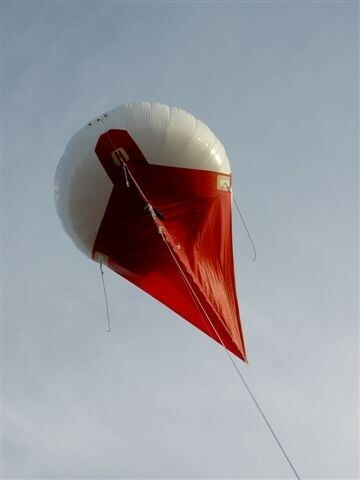 This Helikite has a payload of 30 Kg and designed to cope with winds up to 60 mph and be handled by only two people in fine or foul weather conditions when using a Helibase. 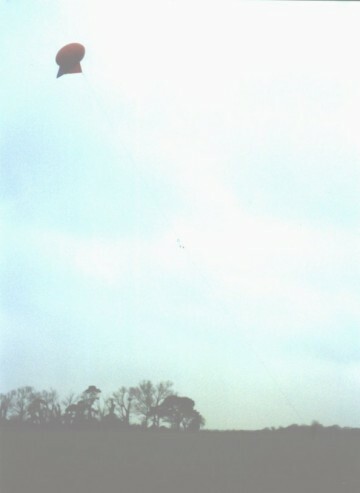 60 cu metre Skyhook Helikite in flight. 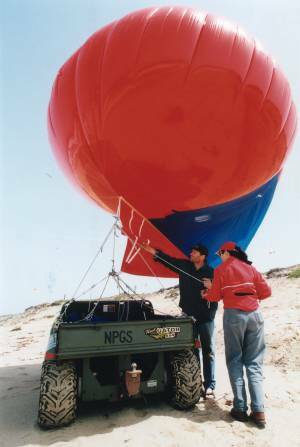 34 cubic metre - Originally designed to lift an emergency communications radio-relay along with a radio-controlled, gyro-stabilised pan/tilt/zoom video camera(see products section). 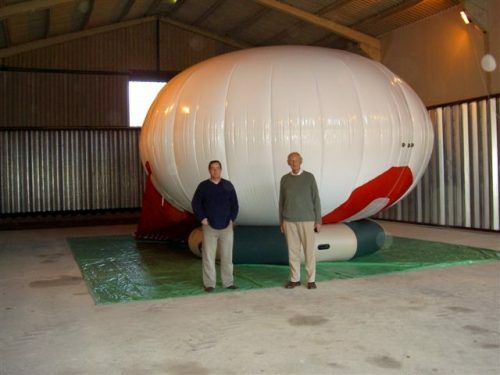 This Helikite can be inflated and lift these payloads to 1000ft within 20 minutes from the roof of a mobile operations room trailer. 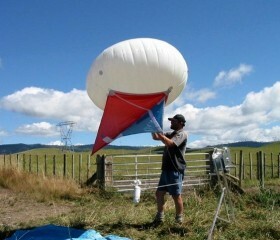 Payload 14Kg in winds up to 50 mph. The prime contractor is Sandia National Laboratories and the trailer is designed and made by Carolina Unmanned Vehicles. 20 cubic metre - This Helikite is made of tough 6 thou/inch polurethane material that gives good abrasion resistance and long-life. 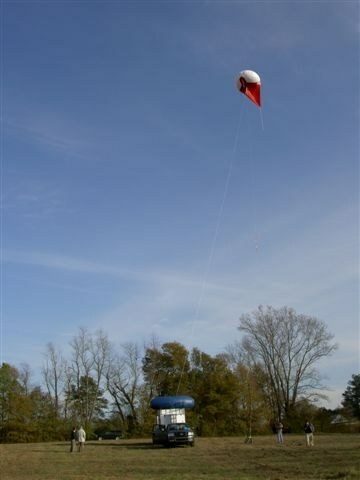 It is very easy to handle in high winds when using a Helibase. 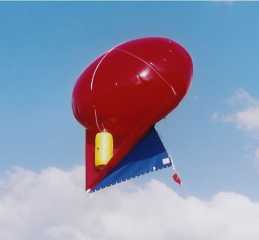 It can fly steadily in very high winds for many days with very little loss of helium. It has a payload capacity of 9Kg and can pack down into a compact case for storage. 16 cubic metre - This is a high performance Helikite for use in situations where as much lift as possible is required whilst still keeping to a size that is easily manhandled. 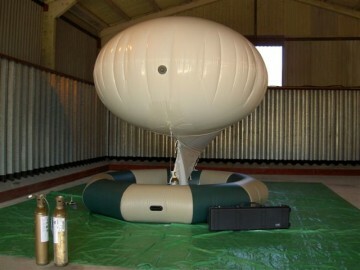 For instance, the white one shown below is presently being used by a European military research organisation to lift radio comms relays over mountains where catabatic winds eliminate other tethered aerostats. 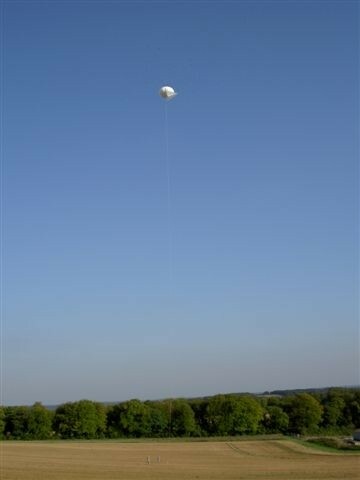 A Helibase is recommended but not essential for this size of Skyhook Helikite. 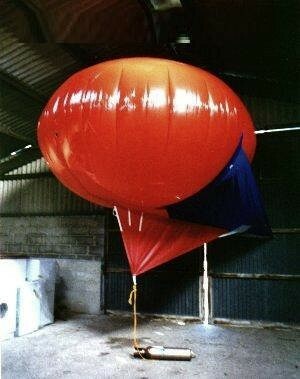 11 cubic metre - A superb all-weather Skyhook Helikite. 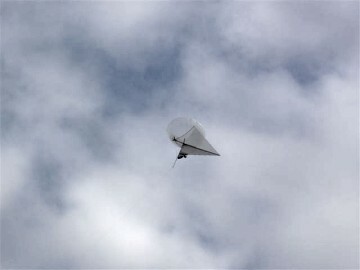 We have had them flying steadily in pelting rain and winds of 50 mph. 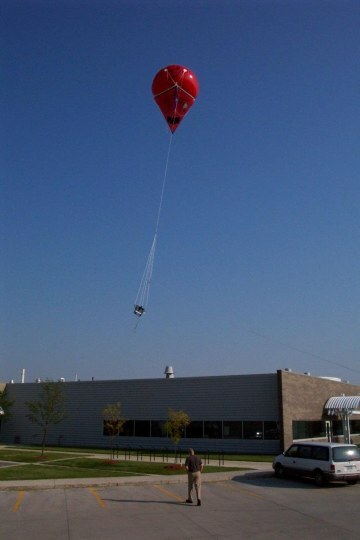 Perfect for reliable lifting of equipment for science or the military. 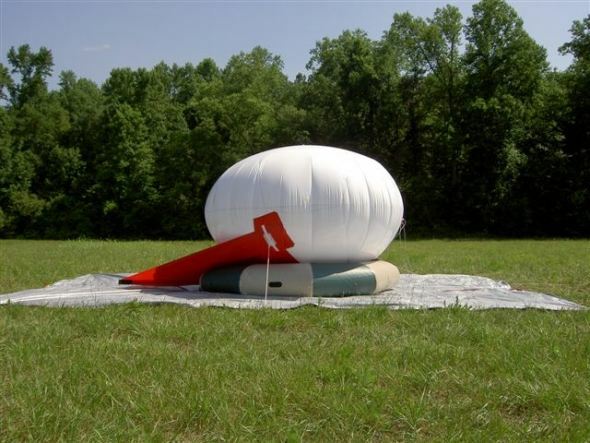 They are still small enough to be fully inflated in a standard 12ft x 12ft British Army tent and then deployed from it instantly. 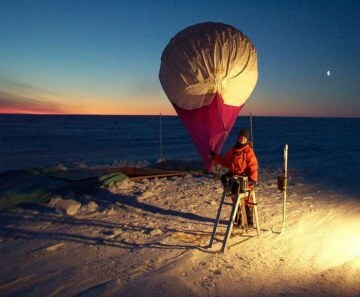 7 cubic metre - A popular scientific Helikite as it has enough performance to lift many scientific payloads to thousands of feet, is very steady in high winds and yet is still fine for one person to handle. 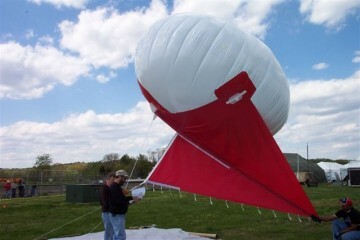 3.3 cubic metre - This Helikite is smaller than 115 cubic feet and so falls outside the scope of much of the US Captive Balloon regulations. This means, that if it is safe to do so, it can often be legally flown up to 500ft without the need to inform air traffic control. 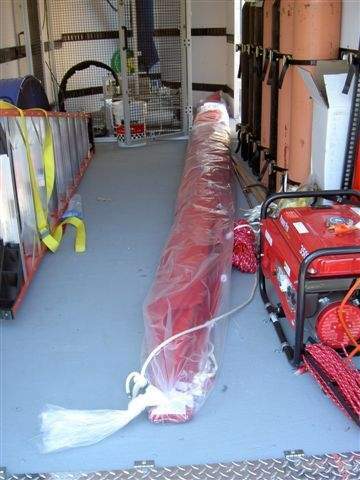 This 9ft long Helikite has a ceiling of 4,000ft. 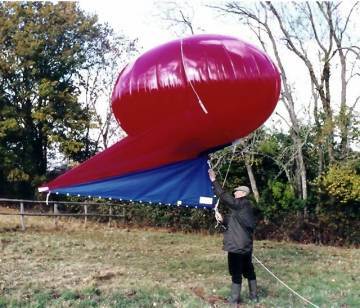 1.6 cubic metre - This 6 ft long Skyhook Helikite will fit in the back of an estate car when fully inflated and yet it will easily fly to 1500ft in a few minutes and can cope with winds over 30 mph. 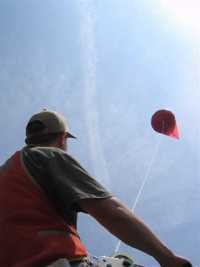 The popular SkyShot Photographic Helikite is based around this size of Skyhook Helikite. Also very useful for lifting aerials, scientific instruments and position marking.